What makes a vintage piano great? In Toronto, some shops send the pianos to China for rebuilding, some to Poland, some to Mexico. Some do it in-house and assign fixed times for each job. Others send it out to small independent shops with a fixed price for the work. Often, we hear “Renner Parts” “Roslau Wire” “Mapes Strings” German this, German that. If only quality came down to a marketing checklist of features, any old job will do. Careful and tedious tuning of the individual aliquots of a Mason and Hamlin. My experience is different. To achieve the maximum from a piano, takes a long time and from the outset, the focus on the outcome, not the cost of the work. Roslau wire may be good for new pianos, but it does not match the designs of many older piano’s wire and design parameters, and thus the stringing scale, and therefore the tone and sustain may be compromised. 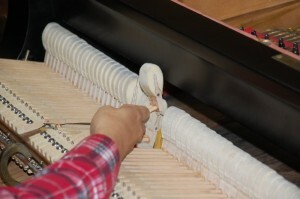 Wire makers who design wire to match different periods of piano making charge more than Roslau. In a results oriented shop like ours, we make our wire choices based on what works for a given piano, and that sometimes means Roslau. Cut thread tuning pins are another example. In our shop experiments and research, we discovered that after repeated tunings, they harm the pinblock and accelerate its failure. Machined tuning pins cost 300% more, but after our research, they are all we use. Action parts must match the design and balance of the action, or the action geometry needs to be reengineered. So many rebuilt pianos will be found to have poor pianissimo control, uneveness, heavy touch, or fatiguing to play. The difference between a properly designed and executed action restoration and one with new parts with no regards to geometry and tone production is massive, as in 400-500% more time needed. To the untrained eye, they look the same, but playing one next to the other shows the difference. We pride ourselves on our action engineering and the time spent to get the full range of expression and control. 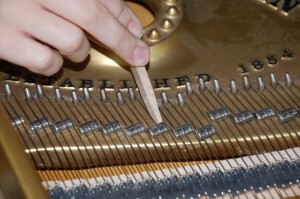 Most new piano hammers are made in a process designed to speed up the manufacturing. Hard felt is moistened and then pressed under high-pressure with heat to get them in and out of the hammer press quickly. The end results mean a technician can install them and do next to nothing for the finished job. The down side, is lack of pianissimo, tone colouring and future strident and ear hurting tone. Traditionally made hammers need skilled technicians and the patience to build the tone. 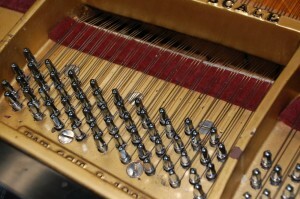 Each set of hammers must match the soundboard and rib design of the piano, and correspond to the geometry of the action. These are big decisions and must be carefully considered before the work begins. So, do the little things count? We think so.